Jumeirah at Saadiyat Island is the newest property to open on Abu Dhabi’s most sought-after beachfront. Since opening its doors in November 2018, the resort has become a firm favourite with residents and tourists a like – and during our two-night visit, we quickly discover why. 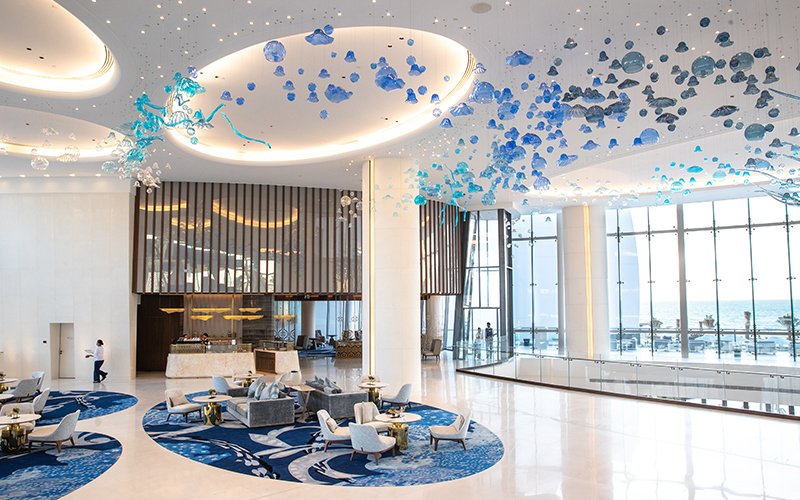 Upon arrival, the first thing that strikes me are the hotel’s white and blue clean, fresh, ocean-inspired interiors, which we’re told are in-line with the property’s sustainable mindset. Jumeirah at Saadiyat Island is Jumeirah’s first-ever fully eco-friendly resort, operating without any single-use plastics. While checking in, we’re given our very own re-usable water bottles to keep, which can be filled up with either chilled still or sparkling water at any time from dedicated water stations around the resort. Once in the room, to my delight there’s no sign of any plastic and even the in-room water sits in Jumeirah-branded glass bottles. 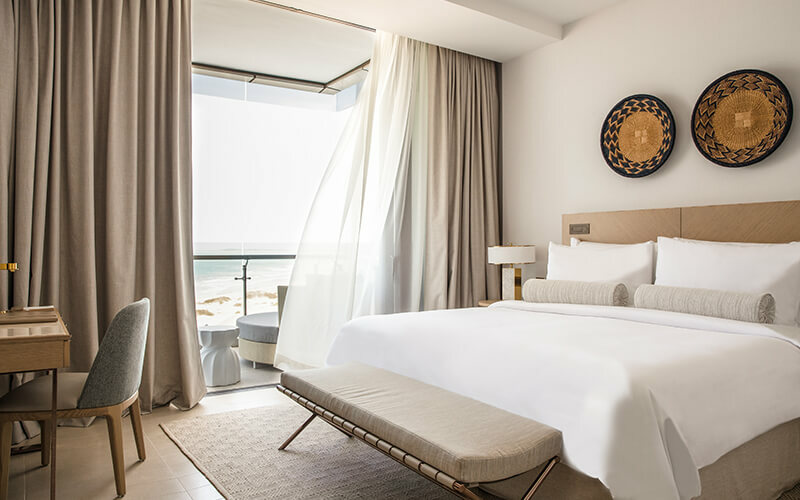 We stayed in an Ocean Deluxe King Room during our visit; just one of the resort’s 292 room options, all of which offer floor-to-ceiling windows, private balconies overlooking the Arabian Gulf, and are beautifully decorated with earthy, natural tones. On-site there’s also eight private high-class villas, offering two, three and four-bedroom duplex villas with private pools five of which have their own spa treatment room. Out on our spacious balcony, the sight’s more than desirable. 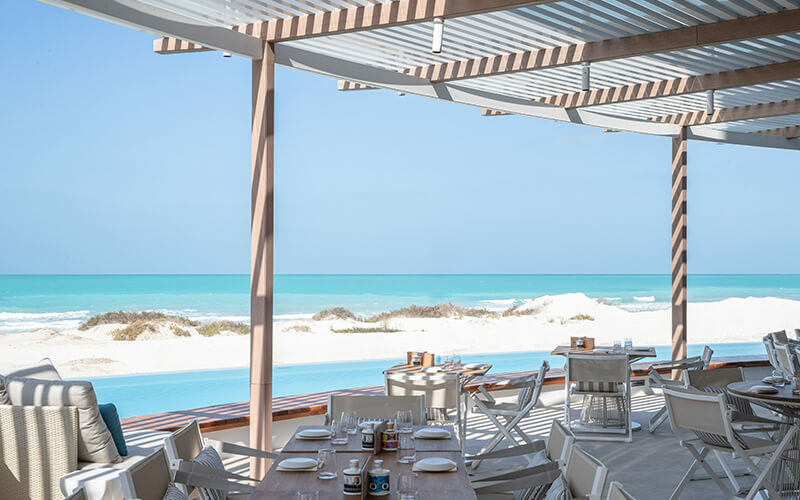 The azure waterfront property overlooks 400 meters of protected sand dunes and un-touched beach, with turtles, dolphins and oryx being just a few of the animals that call Saadiyat their natural home. If nature’s your thing, don’t miss the complimentary educational talks by the resort’s Marina and Environmental team on Tuesdays, Thursdays and Fridays at the Pool Bar. If you’re lucky enough to visit during hatching season, you’ll be able to witness Hawksbill sea turtles journeying into the sea from nests burrowed along the nine-kilometer Saadiyat beach. The Hawksbill is a critically endangered species protected by the Hawksbill Turtle Conservation Programme, run by Abu Dhabi Tourism Development & Investment Company. Since its inception, some 650 eggs have hatched successfully on Saadiyat. There’s an array of food and beverage options available at Jumeirah at Saadiyat Island, catering all tastes. We arrived on a Thursday evening and for dinner visited Mare Mare, the resort’s fully al fresco Italian restaurant serving up delights from the Mediterranean, set against a stunning ocean-front backdrop – dining with the sounds of lapping waves in the background is a treat here. To start, we shared the steamed octopus with potatoes and burrata served with heirloom tomato salad, both of which were simply prepared but tasted great – particularly with the freshly baked focaccia served to the table with great quality olive oil and balsamic. For main, the homemade tonnarelli pasta with chili, garlic, tomato and lemon zest, all topped with half of Canadian lobster is a delight to eat and is packed with flavour. To finish, the tiramisu is prepared classically – just how it should be. Potted individually, the dessert featured generous layers of creamy mascarpone and espresso-soaked lady finger biscuits, topped with a sprinkling of chocolate dust. For breakfast the next day, we head to hotel’s all-day dining outlet, White – which is by no means your average all-day dining venue. The stylishly designed restaurant serves local and international dishes across a spacious buffet area that features live cooking stations. It’s clear to see that high-quality is key to this breakfast buffet when it comes to ingredients, selection, preparation and presentation. We opt to have eggs made to our liking, paired with freshly cut fruits from the carving station, where we also find a range of infused waters and freshly pressed juices, ensuring a highly-nourishing start to the day. There’s also a great variety of pastries, pancakes, waffles and more, if you’re feeling indulgent. For snacks throughout the day, there’s the Pool Bar and a tea lounge located in the lobby called Majlis Saadiyat, which serves a premium selection of refreshments, tea, coffee and pastries throughout the day. For sunset, The Lounge is the go-to spot for sundowners and snacks. This venue is also great for late-night cocktails and Thursday night brunch (details overleaf). On our last evening, we ventured to the Levantine-inspired restaurant, TEAN – another beautiful beachfront outlet (we hear it’s also the perfect spot for sundowners due to its location). Indoor and outdoor seating with shisha is available here, and the restaurant offers an inviting social buzz. Classic Arabic food can be hit and miss, with common mistakes being an over-cooked, dried mixed grill, or overly acidic fattoush, but TEAN steers well away from any culinary errors, in fact it excels, and all dishes served were excellently prepared and presented. We begin with super smoothed hummus topped with tender chunks of lamb and a drizzle of olive oil, Persian feta and watermelon salad with figs, arugula and roasted walnuts, plus a generous serving of fattoush, comprising baby gem lettuce, cucumber, pomegranate, heirloom tomato, sumac and lemon – both salads were bursting with fresh ingredients and zesty dressings. For mains, we share a selection from the grill menu, including corn-fed chicken shish taouk with yoghurt and garlic, tender and juicy Australian Salt Bush lamb marinated with Arabic spice, plus grade 7 wagyu beef shish kebab cooked to a perfect medium temperature. For dessert, the traditional umm Ali brings the meal to an enjoyable close – creamy bread pudding topped with pistachio and raisins. Overall, the dining experiences at Jumeirah at Saadiyat Island boast a high-standard of ingredients, paired with impeccable service. For an ultra-luxurious experience, a visit the spa shouldn’t be missed. Having only just opened, everything is brand new and the space exudes premium luxury. We indulged with a 60-minute full-body ‘Saadiyat Revitalising’ massage which used deep tissue methods to work out all the tension in my body, acupressure point stimulation and light stretching for revitalising, before finishing with long, soothing strokes for ultimate relaxation. If a visit to the spa, the beach or the pool isn’t really your thing, Abu Dhabi has a bunch of fun activities on offer, as well as cultural. Just a short drive away, there’s the Sheikh Zayed Grand Mosque, the Louvre Abu Dhabi, theme parks (Yas Water World, Ferrari World and Warner brothers) and luxury shopping destinations, all within 30-minutes reach distance. 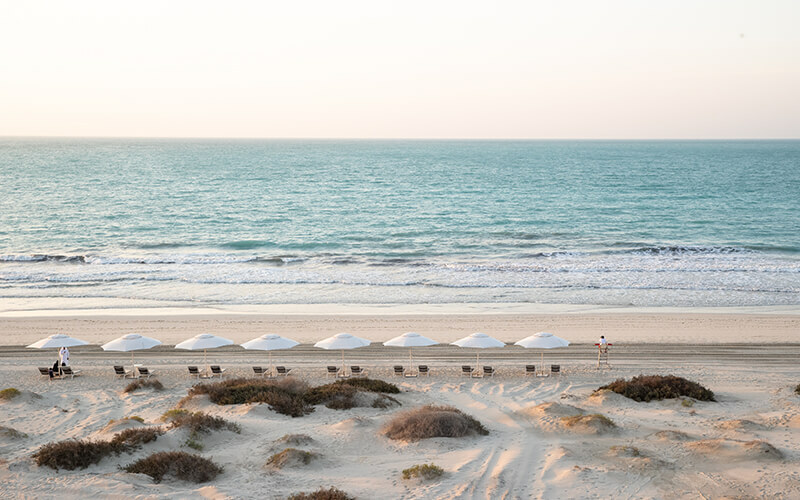 Jumeirah at Saadiyat Island offers understated luxury, top-level culinary options, and plenty of activities, all served up on one of the UAE’s most beautiful beachfronts. Want to go? For hotel reservations, call 02 811 4444 or email JSIQuestions@jumeirah.com. For restaurant reservations, call 02 811 4444 or JSIRestaurants@jumeirah.com. To read more of our UAE-based hotel reviews, click here.